Gather is one of my favorite restaurants in Berkeley. The restaurant has this great cozy ambience with lots of cool details. The menu has a great mix of comfort foods, and incredibly creative pairings. (Their vegan charcuterie is always fascinating, and while I can’t always figure out every component despite the helpful tableside guide, everything tastes amazing.) Plus their cocktails are creative and multi-faceted and just fun to try. 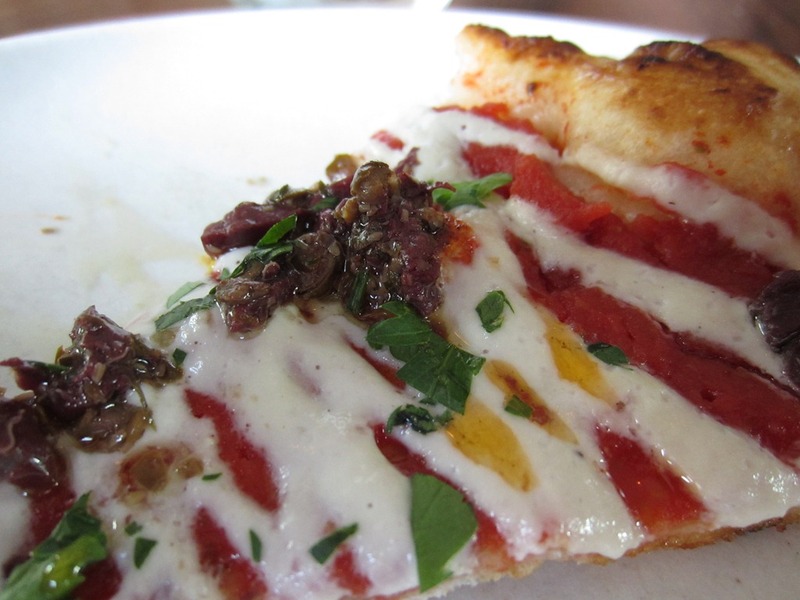 My favorite thing at Gather though, is their vegan pizza with kalamata olives and cashew puree. The cheese is melty and drippy, and tastes like… cheese. I can’t explain it. 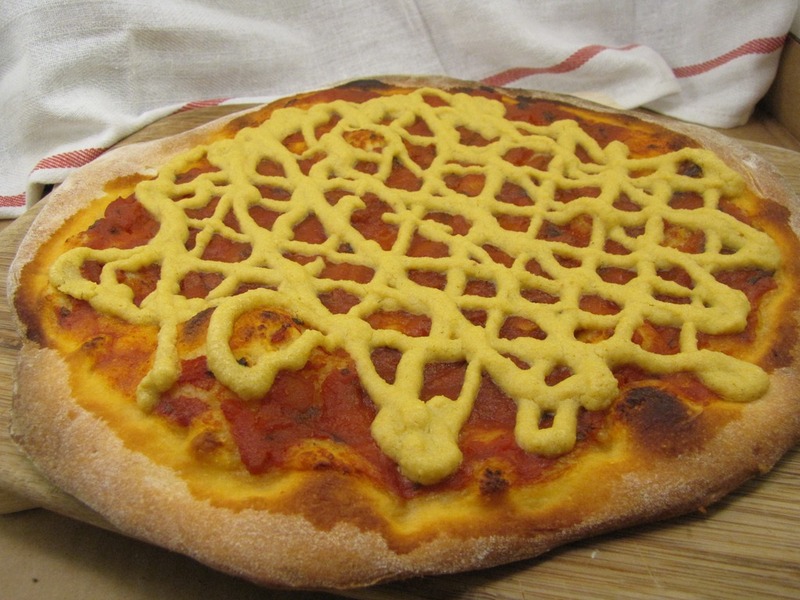 It’s a goal of mine to replicate it at home, since I find it very rare that vegan cheese has such a legitimately cheesy texture. Besides, the pizza tastes amazing and would allow me to satisfy a pizza craving without having to head to the store for fresh mozzarella. This is the only piece of pizza from our latest trip to Gather that survived long enough to photograph. The rest of the pie disappeared before I even thought to pick up my camera. My camera was sitting next to me on the table, too; this pizza is just that good. I had rescued a hunk of the dough from my rosemary garlic olive oil bread, knowing it would make great pizza dough. I stored it in the fridge over night, and then let it come to room temperature and rise again for about an hour before rolling out the dough to make pizza. 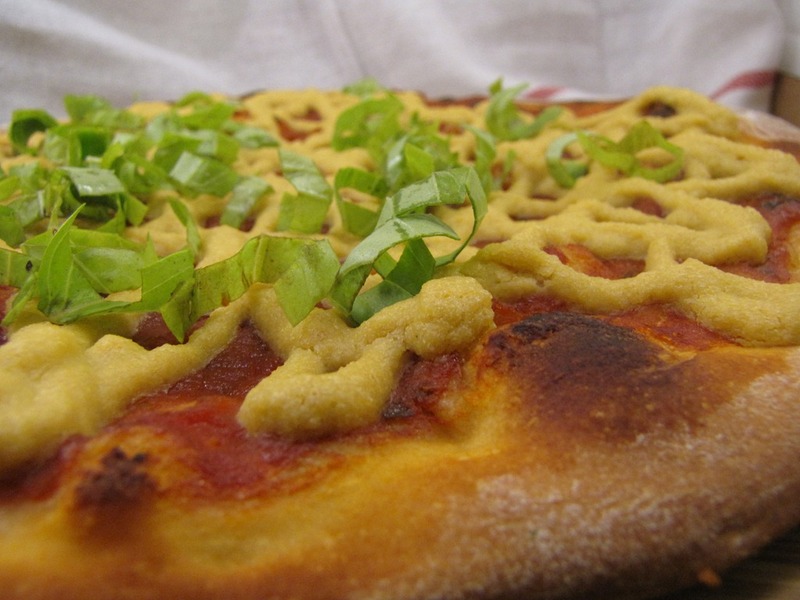 Thinking back on Gather’s pizza, I’m pretty sure it’s just cashew and garlic puree. I added nutritional yeast in my first attempt to replicate it, and while it was tasty, it wasn’t even close to the right texture and consistency. The cashews in the puree actually make this cheese sauce much grainer than Gather’s. I imagine they must strain it in order to get it so smooth (or else they have a really incredible blender). So while this vegan cheese was totally satisfying on my pizza, it didn’t even come close to the melty goodness of Gather’s. Process all ingredients together in a food processor until the consistency is smooth. I piped on the cheese sauce, using a small ziplock bag with the corner cut off. I also baked the pizza until nearly done, just pulling it out 1 minute before to pipe on the cheese and put it back in the oven. I put the pizza back in the oven for just another minute to heat through the cheese sauce, and then I pulled it back out and topped it with fresh basil. While the texture wasn’t even close to Gather’s (you can see in the close up that the sauce is a little grainy), it was still delicious, and the whole pizza was gone pretty quickly. This entry was posted in Food, Recipe and tagged Berkeley, pizza, recipes, restaurant, vegan, vegetarian. Bookmark the permalink. This looks so good! 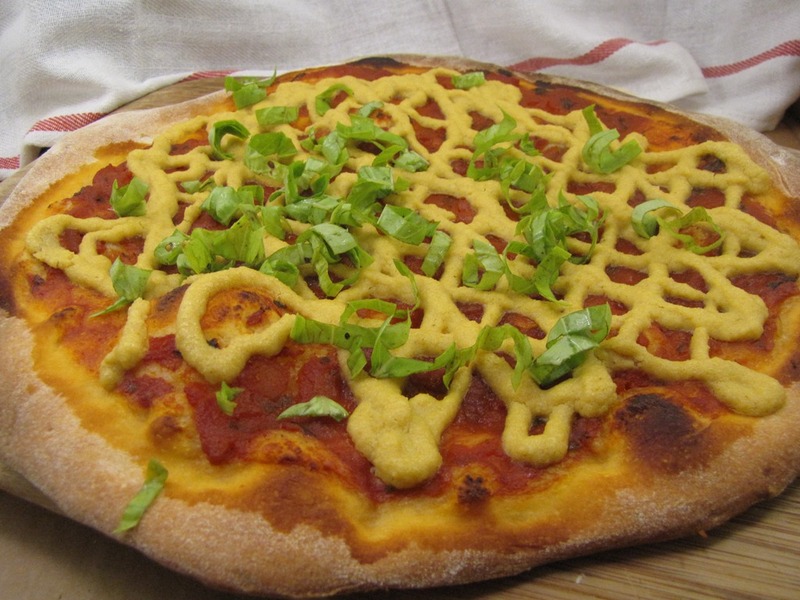 I love cashew cheese, but have never thought of putting it on pizza. I’m definitly going to have to try this! weve been looking for vegan recipes. thanks for posting this!! Awesome vegan recipes. Thanks for sharing and great pictures!